Selecting a telescope for both astronomy and land viewing sounds attractive, but these applications can work against each other, and your choice will usually be a compromise. However, once you have decided on the telescope's main purpose, choosing one can become much easier. If you have decided that your telescope will be used primarily for observing the night sky, the instrument required does not necessarily need to give a right side up image and is not required to focus on nearby objects. With the exception of the moon, planets and close star clusters, interesting night sky objects are faint, in fact most are very faint. As a new observer you may be mainly interested in viewing the moon and planets, and if this is the case, a telescope with a small objective (primary mirror or lens) may be sufficient. However, most observers quickly graduate to galaxies, nebulae, globular clusters, open clusters etc. To view these objects you will require a telescope with the largest aperture that is possible for your circumstances, which will include things like cost, weight, portability, etc. Newtonian reflector telescopes are a popular choice for astronomical use because they have the lowest cost per inch of aperture. Observation of faint deep sky objects, such as nebulae and galaxies, can be achieved at a relatively reasonable cost by reflectors having mirror diameters of 150 to 200mm (6 to 8 inches). 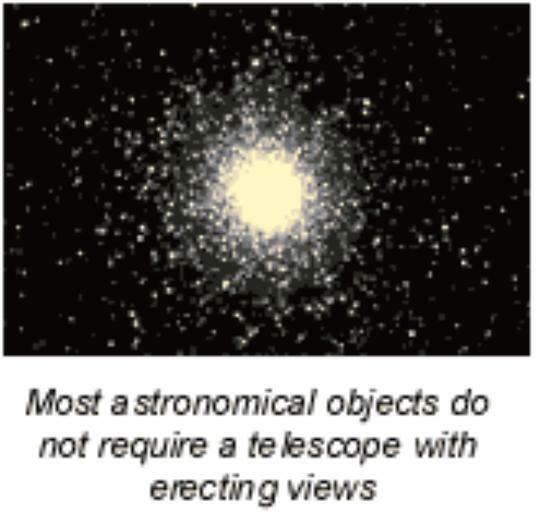 Refractor telescopes are good for achieving high power and contrast when viewing the planets and the moon. They have a reputation of providing crisp, sharp-quality images. Since they are virtually maintenance free, they are easy to operate, but due to high costs for the large aperture scopes, most beginners will choose a Newtonian reflector as a first scope for all round astronomy. Short-tube refractors are now another low cost option for beginners. Their smaller size makes them an excellent choice for a portable telescope and the beautiful wide-field star vistas which they provide, are great for learning your way around the night sky. Terrestrial viewing can easily be achieved with both short and long optical tube refractors, but shorter refractors with apertures of 70mm to 100mm, and focal lengths of 400mm to 700mm are preferred. Shorter scopes have wider fields of view than longer scopes and for land as well as night viewing, gathering more light gives better resolution which is more important than magnification. When choosing a scope for this purpose keep in mind that you will also be trying to look through the air in front of you, and at higher magnifications the image will shimmer, especially on hot, windy days. Newtonian reflectors are not suitable for terrestrial viewing because observing is done through the side of the tube and you therefore have to turn sideways to the target. Since there is no reasonable way to compensate for this, refractors make better terrestrial scopes. For dual purpose viewing, the refractor is a better choice but with larger apertures you do not have to magnify as much to achieve the same resolution. When using your refractor for daytime viewing, a 45 degree erect image diagonal is required to turn the image right side up. For night sky use, a 90 degree star diagonal is almost a necessity to avoid a strained neck. When astronomical viewing in urban areas, using a longer tube will increase the contrast, but it will give you a smaller field of view. If you do want to use larger aperture scopes in the city, just remember to use lower power. All telescopes will perform far better in darker sky areas. Important considerations include convenience of use, portability, ease of storage and ease of transportation to dark sites. Short tube Catadioptric-Newtonians (Sky- Watcher 1141EQ1, 1301EQ2, and 1501EQ3-2) and short tube refractors (Sky-Watcher 705AZ3, 804AZ3, 1025AZ3) are good choices if there are any restrictions.